This album has been a long time coming, seeing as it was due out in November on Ben’s own label Broken Tail Records where he seemed content on releasing it until a friend suggested he send it to Xtra Mile Recordings, and it’s no surprise that they picked him up and agreed to release his debut full length ‘Outside There’s A Curse’. Ben may have got onto what he describes as a ‘real’ label but this album is still as raw as it was ever going to be, most of it was recorded in his bedroom and completed before XMR got hold of it. It’s a real acoustic lo-fi affair which is evident from opening track ‘I Will Breathe You In’. It’s refreshing to hear something with little or no production that in this case showcases a great song writer. The ironically titled ‘Singalong’ is up next, with its catchy chorus and fast paced approach. But ‘Toil’ is up next, with its silky finger picking and effortless melodies. ‘A Shower Of Bastards’ is a short but sweet tale of lost love, whereas ‘They Will Float Your Body Out To Sea’ brings out the anger in Marwood we have become accustomed to, angst ridden and raw as ever. ‘It’s Harder Now To Break Your Stupid Heart’ offers you another snippet of Ben’s toils and troubles which he doesn’t hesitate to deliver in the often witty and observational lyrics. One of the old tracks that have made it onto the album is ‘Oh My Days’, then ‘JJ Abrams’ kicks in with the use of a full band, the piano offering up a new element to the sound filled with pop culture lyricism. ‘Tell Avril Lavigne I Never Wanted To Be Her Stupid Boyfriend Anyway’ strips Ben back to just his guitar and great quintessential English vocal which shines through. ‘The District Sleeps Alone Tonight’ classically works well as an acoustic track and closes out the album with an old fan favourite. This album will no doubt gain Marwood many more fans, largely helped out by the fact that Xtra Mile are putting it out but when a label like that puts out a record that has been recorded in bedrooms with friends then you know it’s something special. Your guess is better than mine of what will come out of this guy when you get him in a studio and back up his great song writing and effortless melodies with sufficient production. 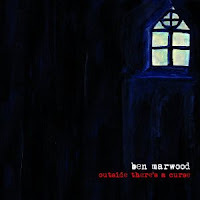 ‘Outside There’s A Curse’ by Ben Marwood is available now on Xtra Mile Recordings. Ben Marwood on MySpace, Facebook and Twitter.